Let's take a look at some recent work from Colleen Frakes, one of the first graduates of CCS. 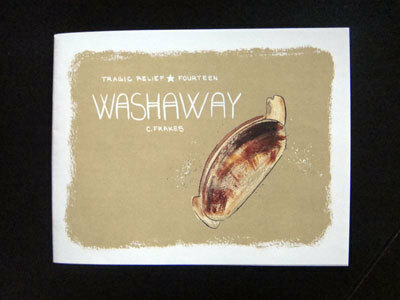 Tragic Relief #14: Washaway. Raised on an island herself, Frakes has a special talent for writing stories about the sea and the frequently sad and lonely people who depend on it. Washaway begins with a woman living in a beach house, going about her daily routine with her dog and seeming generally content. That's until an old friend of hers arrives for a visit, but her hopes are dashed when she learns that he's there to play a gig. The comic alternates between her hermitage in the house, her desperately trying to get the man to stay (and the crushing weight of his rejection -- worse, thinking of her as a mother figure) and the dog attempting to get a similar level of attention. It all ends badly for everyone, as the theme of nothing lasting forever taking on a literal meaning. Frakes is quite adept at depicting desperate characters, and the female protagonist of this story is a powerful and sad story. As always, her spare & simple line is impeccably beautiful and expressive, as she's becoming better and better at depicting body language. 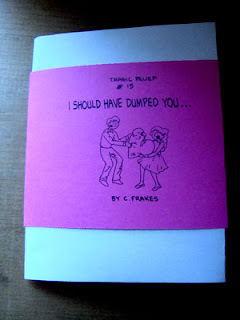 Tragic Relief #15: I Should Have Dumped You... Frakes very rarely dips into autobio stories, and she's the rare cartoonist I'd like to see do more of this kind of story. She's quite good at it, especially when she's going for laughs. The only problem with this very funny mini is that it's way too short. The intro page, where her friends say, "That's hilarious, but you can never publish it" then sees Frakes (whose self-caricature continues to be one of the best in comics) wickedly declare "No...I can totally publish it". Her solution was to take the stories of herself and her friends and transform them into a series of one-panel vignettes featuring a completely different couple. The horrible things that boyfriend says ("You know I'd break up with you if you ever got fat") and does (steals a checkbook only to lose it) are very funny and cleverly portrayed, with a strong emphasis on the relationship in space between the two characters. The only problem with this comic is that it's too short; I could have read a comic three times as long and never gotten tired of it. Finally, Frakes has a short strip in the Doctor Who fanzine allons-y. I could have done without the long essays on Doctor Who fandom, though I suppose such things were inevitable in this sort of zine. Frakes' "You Never Forget Your First Doctor" was typically clever and unabashedly fannish, touching on the ways in which memory can make something seem better than it actually was. The only things really worth reading in the zine were personal takes on the show. I enjoyed GP Bonesteel's imagining Toy Story's Buzz Lightyear as a former companion of the Doctor turned into a toy as well as Jared Rosello's poignant then grimly funny take on facing one's fears.